ImageWare Systems, Inc. (OTCQB : IWSY) is a “speculative buy” for both retail and institutional share market investors because the firm represents an attractive acquisition target for larger biometric firms. Recently the Biometrics Research Group noted that consolidation is a trend that is expected to continue in the biometrics sector. In the medium term, our research firm and investment advisors like Louis Basenese expect larger players to acquire smaller firms such as ImageWare Systems, Inc..
Basenese recently recommended ImageWare as a stock tip in his Wall Street Daily investment newsletter, publicly stating that the company represented “the most attractive investment” in the biometric sector. He cited the firm’s strengths as being its multi-modal, agnostic biometrics platform that has begun to focus on mobile and cloud-based applications. Formed in 1987, ImageWare Systems, Inc. is a leading developer of identity management solutions, providing biometric, secure credential and law enforcement technologies. The firm is headquartered in San Diego, with offices in Portland, Washington, D.C., and Ottawa, Canada. From its inception, the company has focused on highly innovative advanced technology solutions. This evolution of technology advancement, industry leadership and measurable implementation experience has positioned the firm as a leader in the identity management industry, particularly in the segments of biometrics, public safety, secure credentialing and controlled access. Scalable for worldwide deployment, ImageWare’s biometric product line includes a multi-biometric engine that is hardware and algorithm independent, enabling the enrollment and management of unlimited population sizes. ImageWare Systems’ Biometric Engine is a scalable, agnostic platform that ensures only valid individuals gain access to controlled areas. Allowing for multi-biometric searching and matching, the Biometric Engine provides a scalable solution that allows organizations to manage population databases of unlimited sizes. In addition, the Biometric Engine is technology and hardware agnostic, enabling users to employ biometric devices and algorithms from any vendor, as well as support the combination of the following biometric types: finger, face, iris, hand geometry, palm, DNA, signature, voice, 3-D face and retina. In fact, the Biometric Engine currently supports ninety-three hardware devices and methods or image acquisitions as well as sixty-five biometric algorithms, positioning this technology as leading the market in biometric identity management support. ImageWare’s identification products are also used to manage and issue secure credentials, including national IDs, passports, driver’s licenses, smart cards and access control credentials. The firm also offers a software development kit that enables software engineers to create custom identification solutions or incorporate ID functionality into existing applications. Entitled “IWS EPI Builder”, the SDK is used to create everything from simple, corporate ID cards to passports, driver licenses, transit cards, national medical cards, national IDs and more. IWS EPI Builder supports virtually any biometric and has plug and play capabilities with a variety of biometric capture devices and readers. This enables developers to quickly and easily switch from one biometric to another or exchange devices to meet customer requirements. ImageWare Systems also provides comprehensive toolkit suites. These suites include a desktop security application that provides a comprehensive authentication management platform that is optimized to enhance corporate security and usability, avoiding unauthorized access to mission-critical data. The firm also offers an suite that incorporate a wide range of secure credential and identification solutions, that enable users to create custom card layouts with secure design features and capture text, images and biometric data. All this information can then be printed on an ID card or credential with magnetic stripes, bar codes and smart chips. These custom credentials can range from straightforward ID cards to complex documents such as driver licenses, passports or national IDs and health cards. ImageWare’s also offers digital booking products to law enforcement, that feature integrated mug shot, fingerprint live scan and investigative capabilities. The key to all of ImageWare’s tools is its open architecture approach. This approach incorporates a common infrastructure that allows for the orchestration of multiple biometrics, provides the flexibility to incorporate the appropriate biometric for the situation, provides the storage capacity to maintain unlimited and sustainable data, addresses the necessity to evolve as technology changes and ensures adherence to standards. The firm’s software attempts to be hardware agnostic. The Biometric Engine currently supports 93 biometric hardware devices and 65 algorithms. This positions ImageWare as an industry standard architecture for a common biometric identity management infrastructure. The open architecture approach that ImageWare provides has been described by analysts as so unique that it offers a technological advantage over its competitors in the biometric space. This summer, ImageWare obtained approval to use several wireless technology patents that will allow the firm to secure mobile and cloud-based biometric information to levels that would satisfy regulatory regimes such as the Health Insurance Portability and Accountability Act in the United States. This makes the company a ripe target for acquisition. It should be observed however that the biometrics industry is very competitive, with several players, some much larger than ImageWare, working to develop and enhance new technologies. Significant technological advances by a competitive software platform could pose a risk to ImageWare’s future profitability. 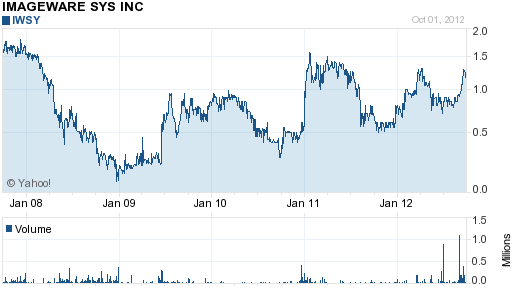 ImageWare only has a market capitalization of approximately US$50 million and trades over the counter. Because of the potential illiquid nature of stock, and its lack of dividend payments, holding shares in the company does carry inherit risk. ImageWare only currently generates small licensing and maintenance revenues, and does not generate consistent earnings. The firm is also subject to risk due to governments being their number one clients. Often with governments, sales cycles can be long and uncertain, due to the erratic and unpredictable nature of government budgeting and the politics of vendor procurement. In addition, ImageWare frequently performs as a subcontractor, which can put the firm at the mercy of the prime contractor’s timing and conditions. With all these concerns, there are many investment risks associated with the company. However, the Biometrics Research Group is impressed with positive news that has recently come from the company, including the addition of a noted financier to its board of directors and the recent release of its cloud base identity management solution at the 2012 Biometric Consortium Conference and Biometric Technology Expo in Tampa in September. Investment advisor Louis Basenese also is impressed with the biometric cloud offerings, along with the company’s pending patent applications related to providing biometric matching for identity verification. He agrees with the firm’s belief that such technology will be critical to providing biometric management solutions for the consumer market where privacy protection has been a historical issue and a barrier to biometric adoption. As a result, Biometrics Research Group, Inc. does perceive a high investment risk in ImageWare, but also perceives high potential rewards and investment return. Biometrics Research Group recommends that you consult an investment advisor before any share market purchase decision.